Unlike the other La Gloria Cubana with which this cigar shares a name—the Serie R Estelí—this is not a Nicaraguan puro. In fact, only the wrapper, a dark, oily leaf from the acclaimed Jalapa Valley, is from Nicaragua. The binder is from the southern Honduran area of Jamastran, while the filler combines tobacco from there and from the western area of La Entrada. The Robustos I smoked are one of three sizes for the new release: Robusto (4.5 x 52, $4.99), Toro (5.5 x 54, $5.99), and Gigante (6.25 x 60, $6.99). The wrapper, surprisingly, offers little pre-light aroma. It’s an easy light and the opening puffs have a deep, charred flavor. Soon, there is a good bit of spice and a little sweetness, which increases in the final third. Along the way I also picked up some cedar and earthiness. Strength was in the medium range. Although I haven’t smoked the other vitolas, the Robusto strikes me as an excellent size. It is not a particularly complex cigar, and in 4.5 inches you can fully experience the blend. The draw was good in each of those I smoked, and the ash held tightly. The burn did require a couple of minor touch-ups that weren’t significant enough to affect the experience. If you go searching for the La Gloria Cubana Estelí, you might need a sharp eye. While the single band includes the word “Estelí” in all caps, a shopper could be forgiven for becoming confused by the brand’s seemingly endless lineup. The non-Cuban La Gloria Cubanagot its start in Miami in the early 1970s and gained an enthusiastic national following during the 1990s cigar boom. Since Ernesto Perez-Carrillo sold the brand in 1999, General Cigar has pumped out extension after extension, some influential and long-lasting, some limited editions, and some eventually killed. And though Perez-Carrillo left General in 2007 to start his own brand, last year he joined in creating La Gloria Cubana Colección Reserva, which is rolled at his factory. 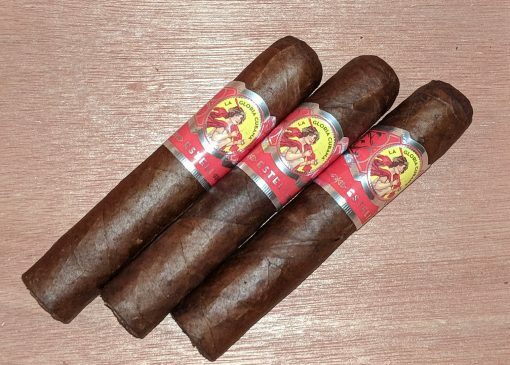 Over the years, StogieGuys.com has reviewed a dozen La Gloria Cubana cigars, with an impressive two-thirds of them receiving ratings of four stogies or higher. This latest iteration earns three and a half stogies out of five.